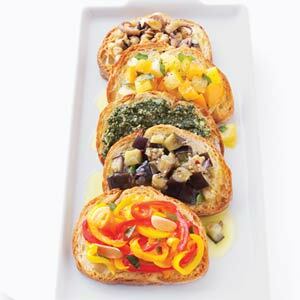 Various toppings for bruschetta at http://www.myrecipes.com. I love a good bruschetta, but have to admit, I have been reluctant to prepare it myself. My biggest fear has been getting the bread wrong–not crispy enough, or too charred, or soggy from too wet a topping. Camille Parker of Camille’s Dish has given me a little confidence, and with tomatoes now growing in abundance, I am going to try it. Here’s a video lesson on making bruschetta–and I love that Camille pronounces it the Italian way. She’d probably get in trouble with her 92-year-old Sicilian grandfather if she said Broo-shet-a like most people do in America! I had the best bruschetta I’ve ever tasted in America in the most unexpected place. Not in Little Italy somewhere, or even in my mom’s kitchen, which is a great place for Italian food. No, right in the heart of the midwest, at Johnny’s Italian Steakhouse next to the Radisson Hotel at Des Moines, Iowa’s airport. No kidding. My sister and I went back twice when we visited Iowa last year, and would have been happy to make that appetizer our entire meal. I didn’t get the recipe from them, but my sister recreated it at home with goat cheese, finely diced roma tomatoes, garlic, a little basil, olive oil. Yum. Okay, now I’m hungry! Are there Italian foods you’ve been afraid to make yourself? Something you wish you’d tried cooking sooner? A great bruschetta combination you’ll share with us? That’s what the comments are for! This entry was posted in Food and tagged Bruschetta, Camille Parker, food, Italy, Johnny's Italian Steakhouse. Bookmark the permalink. Try a pancetta, onion, and canellini bean topping. We found that one on “Extra Virgin”, a cooking show we love. I highly recommend!! Mash em. And Bacon will certainly do the trick. Thanks, Marlie! I think there are lots of non-tomato options, so let me know if you find something wonderful. And if we get a chance to go back to Johnny’s Steakhouse, I hope you can eat the bruschetta again! Unfortunately, I’ve never been to that Little Johnny’s Steakhouse in DesMoines. But I’ve had Bruschetta many times at the Dockside restaurant right here in Sequim where I live – actually I live to eat at The Dockside! But I also make a pretty darn good bruschetta with a little help from my friend, Tommaso.. I like to toast the bread (cuomo, of course, sliced thin) on a cast iron flat skillet with just a smigeon of olive oil. Ahhh so crispy. And from there you have lots of choices. Toes of roasted garlic, fresh tomatoes chopped with basil and fresh garlic and snips of rosemary, parmesan cheese for the asking and, oh yes, gorgonzola is very nice. My mouth is watering, so please pass the minestrone. Thanks for sharing your take on bruschetta, Mom! Ve be, se pero stai preparando bruschette per quattro persone, dovrai usare un metodo che permette di portare a tavola almeno 8 fette calde. Da noi, si usa fuoco o il forno, e l’olio non si mette mai prima di abbrustolire il pane. Il segreto e’ servire appena condita, non qualche minuto dopo…Troppo tardi! Thanks for the additional instruction! and the Italian with translation!! I’m sure people have many different ways of making bruschetta, and it’s fun to see the variety.